The Lake Erie Section of the American Society of Highway Engineers (ASHE) is proud to host the 2018 ASHE National Conference at The Westin Cleveland Downtown in Cleveland, Ohio. 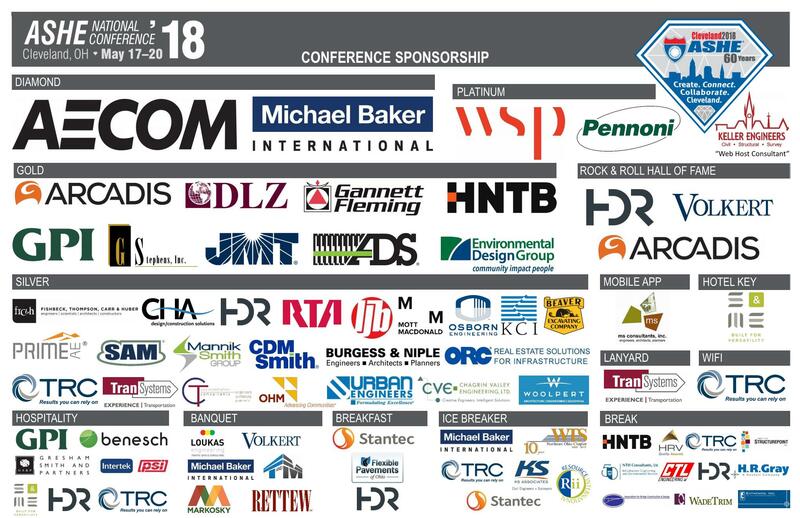 The conference will attract over 500 public and private sector design professionals, vendors, contractors and guests from across the country, and provide a forum for networking and education on topics relevant to the transportation industry. The agenda is filled with informative technical sessions, social events and networking opportunities. This ASHE conference marks the 60th anniversary of the organization and plays a critical role in progressing the mission of ASHE to provide a forum for members and partners of the highway industry to promote a safe, efficient and sustainable transportation system through education, innovation and fellowship. We need your support to make this historic event a success! A variety of sponsorship opportunities and sponsorship levels were developed to meet a broad range of marketing budgets so your company can be recognized as a conference partner, furthering the goals of ASHE. A conference representative will follow-up with you to discuss your participation and answer any questions you may have.